Phase 3 data from NERV's roluperidone is expected soon. Cariprazine and amisulpride represent two potential competitors to roluperidone that are currently marketed. Competitors that are still in the pipeline include ACAD's pimavanserin and TAK's TAK-831. Minerva Neurosciences (NERV) is set to report data from multiple clinical trials in 2019 but roluperidone, which NERV is developing as a treatment for the negative symptoms of schizophrenia, is likely to get a disproportionate amount of attention. NERV and others developing in the negative symptoms space are quick to note that there is no FDA approved therapy specifically for the negative symptoms of schizophrenia. Despite that, if successful, roluperidone could still face some competition from off-label use of existing antipsychotics and eventually new antipsychotics which are also currently in development. This article takes a look at that competition. NERV's sole Phase 3 trial is a randomized, double-blind, placebo-controlled study of roluperidone in adults with negative symptoms of schizophrenia. Of the five catalysts ahead in 2019, this study, which is expected to produce top line data in mid-2019, is the most important for the fate of NERV's share price. Figure 1: NERV's pipeline will produce five readouts in 2019 from four Phase 2b studies and one Phase 3 study. Source: NERV corporate presentation. The importance of the roluperidone trial comes not only because the study is a Phase 3 and includes 501 participants, but because of the indication. Negative symptoms of schizophrenia, such as anhedonia, asociality and blunted affect, don't generally respond well to most currently available antipsychotics. While studies continue to compare newer antipsychotics, findings do not support a significant difference between atypical antipsychotics in the treatment of negative symptoms [21–23]. Evidence, to date, including several recent meta-analyses [15, 21], aligns with other earlier studies indicating: (A) the newer antipsychotics are not superior to their conventional counterparts in the treatment of negative symptoms and (B) the effect in either case is modest. - Remington et al., Curr Treat Options Psychiatry, 2016, 3:133-150. Some of the most recently launched antipsychotics include Lundbeck (OTC:HLUKF; OTCPK:HLUYY) and Otsuka's (OTCPK:OTSKF; OTCPK:OTSKY) brexpiprazole (Rexulti) as well as Allergan Plc (AGN) and Gedeon Richter's (OTC:GEDRY; OTC:RGEDF) cariprazine (Vraylar/Reagila in Europe). Cariprazine comes with claims of improvement in negative symptoms, although mainly in papers written by GEDRY and AGN employees. The fact that these claims come from the industry's own interpretation of the data should be viewed with caution given the same claim - that meaningful benefit on negative symptoms had been achieved - was seen with atypical antipsychotics launched during the 90s and 00s. As mentioned in the quote above however, meta-analyses have suggested the benefit of those atypical antipsychotics over typical antipsychotics on negative symptoms is questionable and the benefit itself is marginal. Figure 2: Least squares mean change from baseline in Positive and Negative Syndrome Scale (PANSS) factor score for negative symptoms (FSNS) across 26 weeks of treatment with cariprazine or risperidone in schizophrenia patients with predominant negative symptoms. *p=0·0079, †p=0·0011, ‡p=0·0016, §p=0·0022. Source: Németh et al., The Lancet, 2017, 389(10074):1103–1113. With cariprazine I won't say we are seeing a repeat of the 90s and 00s, the drug does appear to have some genuine benefit on negative symptoms, although AGN hasn't run the studies I would have liked to show that. For example, cariprazine was run in a 461 patient randomized, double-blind, head-to-head study against the antipsychotic risperidone in schizophrenia patients with predominant negative symptoms. Patients enrolled in the trial were allowed to have a low level of positive symptoms. I would have liked a placebo arm in the study rather than the assumption that risperidone would be equal to or would beat placebo. Further, the 461 patient study was run in 11 European countries, so it wouldn't have included US patients. Apparently, the FDA didn't like one of these features (or something else I haven't mentioned) because when AGN submitted an sNDA for cariprazine for the treatment of negative symptoms in schizophrenia in 2017, it received a Refusal to File (RTF) letter. 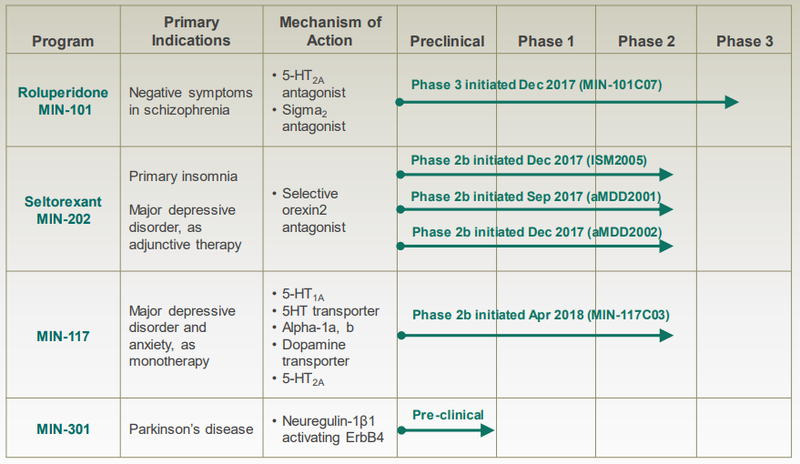 AGN's current pipeline (slide 20) notes trials in major depressive disorder and autism plus a pending application for cariprazine in bipolar disorder. Development in the negative symptoms of schizophrenia indication however appears to have been ceased. In Europe, the 461 patient study is one of the five studies which supported European Medicines Agency (EMA) recommendation for approval of cariprazine for schizophrenia. Cariprazine is not specifically approved for negative symptoms of schizophrenia, just the more broad indication of treatment of schizophrenia in adult patients. The European situation is thus similar to the US situation. Despite the RTF letter from the FDA and lack of specific approval for negative symptoms in Europe, AGN and GEDRY seem to be quite vocal about the efficacy of cariprazine in negative symptoms. The efficacy of the drug in treating negative symptoms is discussed in press releases, papers, and at conferences which have been issued/published/attended since AGN received the RTF letter. For example, GEDRY issued a press release in October 2018 noting new post hoc analyses of previous studies of cariprazine which the company believes demonstrate the efficacy of cariprazine in treating the negative symptoms of schizophrenia. All in all the post hoc analyses presented at the conference, underlined that cariprazine can be a reliable and effective treatment possibility for patients with predominant negative symptoms, with a favorable safety profile. - GEDRY press release, October 10, 2018, emphasis theirs. With all this discussion of cariprazine's results in treating negative symptoms, I believe some prescribers will use cariprazine in the negative symptoms indication despite the fact it isn't specifically approved for that. As such cariprazine is a likely roluperidone competitor, should roluperidone itself be approved in the treatment of negative symptoms. Lastly, on potential cariprazine-roluperidone competition, I will note that the pharmacology of the two agents is different. Both drugs are antagonists of the 5-HT2A receptor but cariprazine, is a partial agonist of D2 and D3 dopamine receptors. This later action gives cariprazine characteristic side effects such as akathisia and other extrapyramidal symptoms. I believe that even if physicians thought roluperidone and cariprazine had similar efficacy in the treatment of negative symptoms, many might still prefer roluperidone based on the side effect profile. One other competitor worth mentioning is amisulpride, which, at least in some European markets and Australia is indicated for predominant negative symptoms. The most recent support for the efficacy of amisulpride in treating negative symptoms in schizophrenia comes from a meta-analysis of 21 trials of various anti-psychotics in both schizophrenia patients with prominent negative symptoms (in addition to positive symptoms) and predominant negative symptoms. That study concluded that of the antipsychotics studied, only amisulpride outperformed placebo in the treatment predominant negative symptoms. Amisulpride is off patent and so is available relatively cheaply as a generic in these markets (Europe and Australia). In the US however, amisulpride isn't approved for schizophrenia and so it doesn't really represent a roluperidone competitor in the US. Moving away from amisulpride and cariprazine which are already on the market, we can take a look at some drugs in the pipeline being developed for the treatment of negative symptoms in schizophrenia. Avanir Pharmaceuticals, an indirect subsidiary of Otsuka Pharmaceutical Co., is running a Phase 2/3 placebo-controlled study of AVP-786 (deuterated dextromethorphan hydrobromide/quinidine sulfate) in an estimated 370 schizophrenia patients to assess its efficacy in treating negative symptoms. The study only recently began recruiting however and isn't expected to complete until July 2022. As such AVP-786 isn't likely to rain on NERV's parade anytime soon. ACADIA Pharmaceuticals (ACAD) is running a phase 2 study of its inverse agonist of 5-HT2A and 5-HT2C receptors, pimavanserin, called ADVANCE. ADVANCE is a randomized, double-blind, placebo-controlled study of pimavanserin as an adjunct to background antipsychotic therapy in schizophrenia patients with predominant negative symptoms. With an enrollment of 380 patients, despite the fact that ADVANCE is only Phase 2, its results are likely to be taken pretty seriously by the market and could impact NERV. 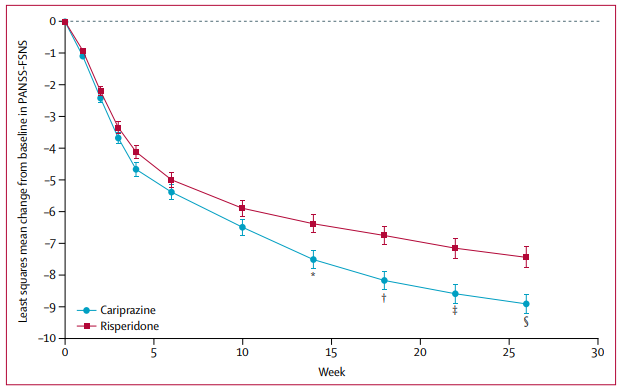 Figure 3: Change from baseline in PANSS total scores in a 423 patient study of pimavanserin (PIM) vs placebo as an adjunct to haloperidol (HL) or risperidone (RIS) in schizophrenia patients experiencing an exacerbation of psychotic symptoms. Note the efficacy of 2 mg risperidone plus 2mg pimavanserin (RIS2PIM, -23.0 at day 43) offers similar efficacy to 6 mg risperidone plus placebo (RIS6PBO, -23.2). The difference between RIS2PBO (-16.3) and RIS2PIM (-23.0) was significant at day 43 (p=0.007). Source: Herbert et al., Schizophr Res, 2012, 141(2-3):144-152. ACAD's previous results with pimavanserin in schizophrenia (Figure 3) do look promising, however these results were obtained in patients experiencing a recent exacerbation of psychotic symptoms. Data from patients with an exacerbation of positive symptoms only have such worth in predicting the outcome of a study like ADVANCE which looks at schizophrenia patients with predominant negative symptoms. 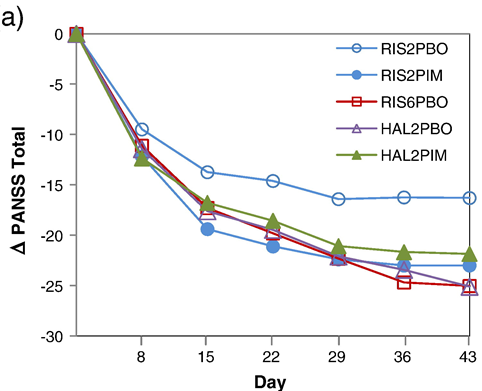 While the figure above looks at total PANSS scores, the addition of pimavanserin to risperidone also appeared to reduce PANSS negative subscale scores. However improvement in negative symptoms can sometimes be secondary to improvement in positive symptoms or depression. As such the fact that pimavanserin appeared to improve negative symptoms, in patients who also experienced an improvement of their recently exacerbated positive symptoms, might not actually mean pimavanserin would work for negative symptoms in patients where positive symptoms were already under control. 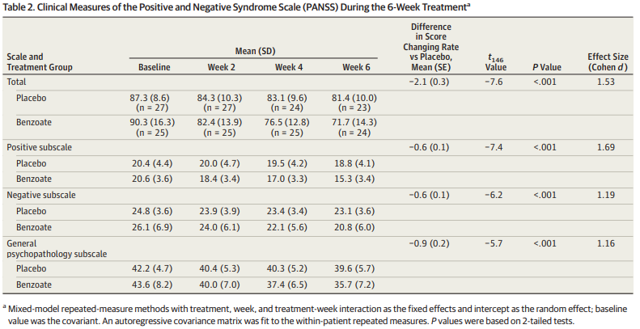 Table 1: Change in PANSS scores (Mean, SEM) from baseline to day 43 (intention-to-treat, last observation carried forward). Note that the difference between the RIS2PBO and RIS2PIM group on the negative subscale was significant (p=0.018). This greater improvement in negative symptoms however is in the context of a numerically greater improvement in positive symptoms (although that difference on the positive subscale isn't quite statistically significant). Source: Herbert et al., Schizophr Res, 2012, 141(2-3):144-152. A February 2019 presentation from ACAD notes that ADVANCE is expected to complete enrollment in 2H'19. Given ADVANCE has a primary endpoint at 26 weeks, it doesn't look like results would be announced until 2020, at which point NERV might already have submitted an NDA for roluperidone. That doesn't mean success for ACAD wouldn't cause NERV to trade down, but it does mean the threat to NERV from ACAD in the negative symptoms indication won't become clear in 2019. ACAD does have another Phase 3 study of pimavanserin in schizophrenia called ENHANCE, but ENHANCE doesn't look specifically at negative symptoms, rather at patients with inadequate response to current therapy. Still, a positive result in ENHANCE would be another display of pimavanserin's efficacy in schizophrenia and might impact NERV. ENHANCE has an estimated primary completion date of August 2019 and so results might not come until September 2019, meaning results with roluperidone might come first. In December 2018, HLUKF commenced a Phase 2 placebo-controlled study of Lu AF11167 in schizophrenia patients with persistent prominent negative symptoms. The 240 patient study is set to complete in May 2020 which makes it slightly more relevant to NERV longs than the AVP-786 study, however HLUKF's study is only Phase 2. Further, Lu AF11167 is a phosphodiesterase 10A (PDE10A) inhibitor. Pfizer (PFE) previously ran a 259 patient Phase 2 trial of its own PDE10A inhibitor mardepodect (PF-02545920) at two doses (5 and 15 mg) against risperidone and placebo in schizophrenia. 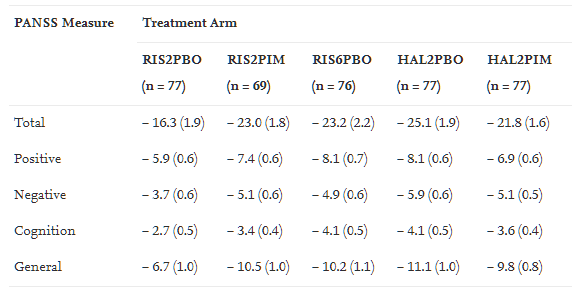 The results weren't good however, neither dose of mardepodect was significantly better than placebo on the PANSS whereas risperidone was (indicating the trial was capable of picking up an effect). A subsequent 240 patient study of PF-02545920, again at 5 and 15 mg, as an adjunct in schizophrenia patients with sub-optimal response to current therapy, was also negative (the trial was stopped early due to a lack of efficacy). The development of multiple other PDE10A inhibitors has also been discontinued. It certainly appears it is hard to get it right with a PDE10A inhibitors and so we can hardly assume success for Lu AF11167. The Shanghai Mental Health Center is running a placebo-controlled Phase 4 trial of the selective estrogen receptor modulator raloxifene in postmenopausal women with schizophrenia (with negative and cognitive symptoms). Raloxifene is already on the market for osteoporosis and reduction of risk in of breast cancer. Given the patient population (only women 45 years or older) a positive result wouldn't necessarily be the worst news for NERV shareholders, further the study is only looking to enroll 45 patients. As such the results could represent an encouraging proof-of-concept but are unlikely to spur widespread prescribing of raloxifene to postmenopausal schizophrenia patients. The study is estimated to complete in June 2019. Millennium Pharmaceuticals, a subsidiary of Takeda Pharmaceutical Company (TAK; OTCPK:TKPHF) is running a placebo-controlled Phase 2 study of TAK-831, as an adjunct to background antipsychotic therapy in 234 schizophrenia patients with negative symptoms. The trial limits the severity of positive symptoms allowed for enrollment in the trial and the primary endpoint is the change from baseline to day 84 in PANSS Negative Symptom Factor Score. NERV investors don't have to worry about TAK-831 in 2019 however, as TAK's Phase 2 study has an estimated completion date of April 2020. TAK-831 is a D-amino acid oxidase (DAAO) inhibitor, which means it will increase the concentration of D-serine in the brain. 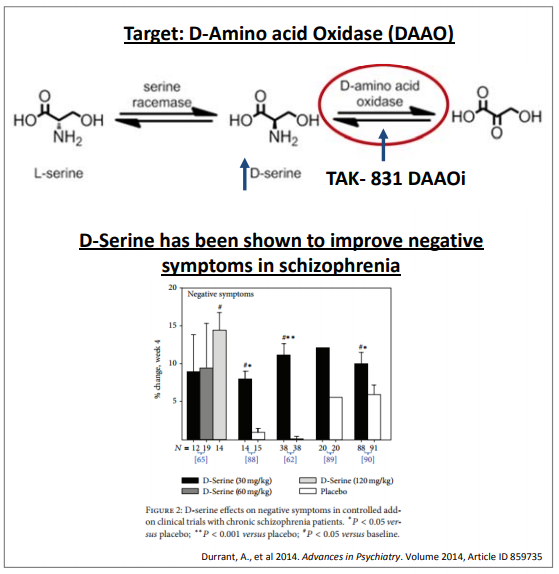 Since D-serine seems to have some efficacy in the treatment of negative symptoms, TAK-831 might too. Figure 4: Mechanism of action of TAK-831 (upper panel) and results from several studies of D-serine (lower panel). Source: TAK presentation. While the mechanism of action for TAK-831 sounds compelling, so does the mechanism of action of the vast majority of drugs entering clinical trials, and yet the vast majority of drugs entering clinical trials are never approved. As such we can't make any assumptions about TAK-831 and will simply have to wait for phase 2 data. SyneuRx International is developing NaBen (a proprietary formulation of sodium benzoate) for schizophrenia. Sodium benzoate functions as a DAAO inhibitor (just like TAK-831). A previous six-week Phase 2 trial of sodium benzoate (or placebo) in 52 patients with schizophrenia (who had been stable on antipsychotics for at least three months) produced positive results. This study did not specifically enroll patients with negative symptoms, merely patients who were still symptomatic, with no clinically significant fluctuations in disease severity, despite current antipsychotic treatment. Table 2: Results from a 52 patient, randomized, double-blind study of sodium benzoate (1 gram/day) or placebo in schizophrenia. Note the benefit of the drug is seen on both negative and positive symptoms, although as discussed this wouldn't necessarily guarantee efficacy of the drug in patients with predominant negative symptoms. Source: Lane et al., JAMA Psychiatry, 2013, 70(12):1267-1275. I caution readers against taking this result as evidence that TAK-831 might work. Sodium benzoate is a simple molecule and while I am sure it inhibits DAAO, it probably does other things too. Still, the fact that sodium benzoate worked in this trial bodes well for future work with NaBen in schizophrenia. There are two trials of interest with NaBen, at least for NERV investors. The SND12 study, a Phase 2/3 placebo-controlled trial looks at NaBen as an adjunctive therapy in an estimated 287, clozapine-refractory, schizophrenia patients. The SND13 study is a placebo-controlled Phase 2/3 study that aims to test NaBen as an adjunct to current antipsychotic therapy (other than clozapine) in an estimated 348 schizophrenia patients with residual symptoms. The SND13 study in particular looks likely to enroll a lot of patients with predominant or prominent negative symptoms but it isn't really clear if SyneuRx could get approval specifically for the treatment of negative symptoms with these trial designs. 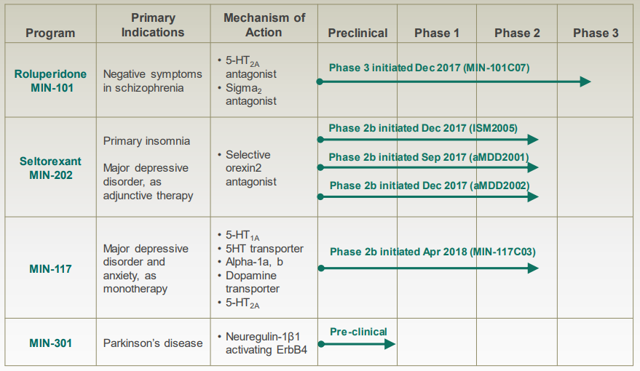 Instead SyneuRX is going after "refractory" and "residual symptoms" subsets of schizophrenia patients, which is another clever way to achieve differentiation over existing antipsychotics. That being said, it also means NaBen right now isn't necessarily a direct roluperidone competitor given NERV's focus on "negative symptoms." The SND13 study as an estimated completion date of June 30, 2019 and the primary completion date of December 2018 has already passed, yet both SyneuRx's website and the clinicaltrials.gov entry list the trial as recruiting. The last drug worth mentioning is Roche's (OTCQX:RHHBY) RG7906 (RO6889450). RHHBY is running the drug in a randomized, double-blind, placebo-controlled Phase 2 trial in patients with schizophrenia, or schizoaffective disorder, with negative symptoms. The primary endpoint in the trial is the change from baseline to week 12 in the Brief Negative Symptoms Scale. The trial has an estimated enrollment of 500 patients but only commenced in December 2018, as such the study isn't set to complete until July 2020. RHHBY has provided little information on the drug but a previously completed 164 patient Phase 1 program coupled with the current 500 patient Phase 2 study suggests RHHBY is very interested in the negative symptoms space. There are a variety of potential competitors to NERV's roluperidone, but in each case there are factors which limit competition. Cariprazine isn't actually approved specifically for negative symptoms in the US and it doesn't look like AGN plans to resubmit its sNDA. Amisulpride is indicated for negative symptoms in some places in Europe and Australia, but isn't even available in the US. AVP-786 won't be producing results until 2022 and 2020 results for Lu AF11167, TAK-831 and RG7906 while closer, won't come before NERV reports results from roluperidone. That leaves us with 2019 results from raloxifene, which only apply to post-menopausal women and will only come from 45 patients, results from NaBen which really apply to residual symptoms or refractory schizophrenia not specifically negative symptoms, and results from ACAD's pimavanserin. That last one is the only one which has a higher probability, in my opinion, of ruining the fun of NERV investors. ACAD's ADVANCE study is something investors must keep an eye on, but slippage in timelines has meant ACAD is currently only providing guidance for completion of enrollment in 2H'19, so NERV investors have likely been saved by delays. I'm bullish on NERV's Phase 3 study of roluperidone, I've previously written that I liked the Phase 2 data. Investors holding NERV mid-year 2019 in anticipation of the Phase 3 data are exposed to readouts from NERV's four Phase 2b studies. This article doesn't provide a preview of what those studies might produce although I've previously suggested MIN-202 is likely to succeed in insomnia. The obvious risks with any long in NERV relate to failure of any of its clinical studies. I do believe that success in one of the Phase 2b studies of MIN-117 or MIN-202 might not offset the hit the stock takes if the Phase 3 study of roluperidone fails.